A page from Mary Jane Heitman’s scrapbook that includes photographs and memorabilia along with a handwritten poem musing about the future. New materials from Davie County Public Library are now up on DigitalNC, including a set of 6 journals by James McGuire Jr., a collection of photographs of Arden Farms in Forsyth County, and a scrapbook compiled by Mary Jane Heitman. James McGuire Junior’s journals take the form of Gude’s Pepto-Mangan Physician’s Memorandum books. Each page corresponds to a day of the year, and includes a short medical fact, often related to Gude’s Pepto-Mangan medicine, along with a space to write. James McGuire Jr., a prominent business man in Mocksville, North Carolina, wrote many short entries recounting topics such as the weather, travel, social engagements, shopping lists, and finances. The memorandum books themselves most likely originated from James’ father, Dr. James McGuire, a physician. 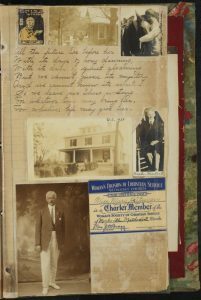 Mary Jane Heitman’s scrapbook tells the story of her life in photographs, news articles, postcards, handwritten musings, and illustrations from 1891-1927. Mary Jane Heitman was a teacher and historian from Mocksville, North Carolina, and her scrapbook recounts with fondness both her time as a student and a teacher. Each page is poetically constructed, and photographs and descriptions of friends and relatives are distributed throughout. The last page of the scrapbook includes a written tribute by one of her students from Salem Academy that was added after her death in 1962. To see more materials from Davie County Public Library, visit their partner page, or take a look at their website. 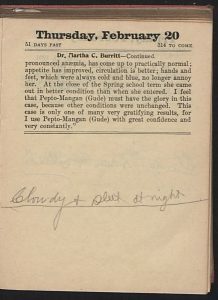 James McGuire Junior’s entry from February 20, 1902 that describes the weather as cloudy with sleet at night.